Here’s lookin’ at you, kid! The strikingly handsome Bull Terrier breed has a distinctive, strong head and a charming personality, which is a little surprising given their stout, tough appearance. 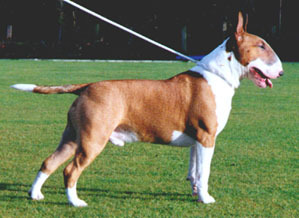 Bull Terriers have a unique, oval head shape that is immediately recognizable. Like a chiseled prize fighter, these dogs have a powerful set of shoulders and a muscular chest. Their almond-shaped eyes are on the smaller side and close together, which serve as a unique contrast to their large, pointy ears. Their eyes and ears give them an alert, inquisitive expression, which matches the strong curiosity streak in this dog's fascinating personality. Their paws are quite round for a canine, almost cat-like in their appearance. Bull Terriers have a short coat that is glossy to the eye but a bit rough on the hands. Their coloring is either solid white, with or without markings on the head, or any other color with white markings on the head. Brindle is the second-most common color after white. Bull Terriers enjoy socializing with other people, but they also have a roguish streak — they love a good joke or game. Like so many tough breeds, they are incredibly stubborn and are a bit too hot to handle for a first-time dog owner. But for experienced dog owners, this is a great family pet with a unique look and a distinctive personality. 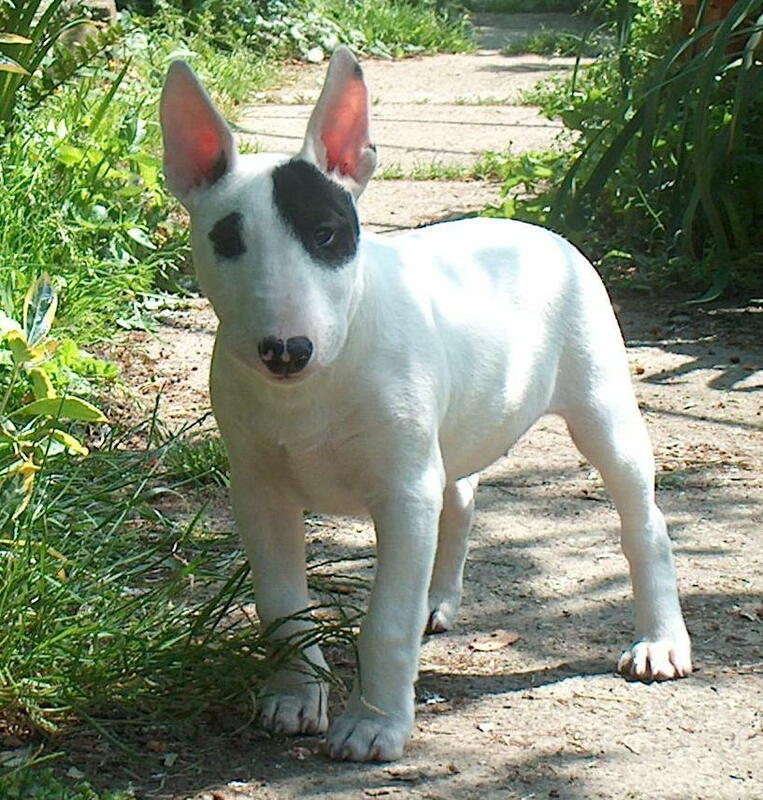 Height (Male) 21 - 22"
Common Misspellings Bul Terrier, Bull Terier or Bullterrier. Bull Terriers genuinely enjoy being around people. They are always up for a new game or even helping you play a joke on a friend. Whether it's hiding something, dressing in a costume, or learning a choreographed trick to perform with you, this breeds sociable temperament makes them a lot of fun to have around friends and family. The Bull Terriers behavior toward other dogs, however, is a bit more mixed. They can be aloof with other canines who are the same size or bigger. With smaller animals, though, they tend to chase them around and not in a joking way. If you adopt a Bull Terrier from a shelter, make sure to ask plenty of questions about their past. Mistreated members of this breed occasionally act aggressively toward other dogs, regardless of their size. But with proper training, their charming nature can extend to other dogs and pets, as long as they are socialized thoroughly while young. Speaking of training, these pups are quite stubborn, and training a Bull Terrier in the art of obedience is not for the faint of heart. However, with enough positive reinforcement, this breed will happily follow you anywhere! Bull Terriers require plenty of of training, especially while young. Daily physical and mental exercise is required to keep them healthy, happy, and alert. Opening the door and letting them get their wiggles out in a small backyard isnt going to be enough. Long walks, going for runs, sprinting around a medium to large fenced-in yard, and learning new tricks are more their speed. If you dont take the time to stimulate them, they will find find an outlet for their extra energy and that usually involves focusing their attention on your physical property. That favorite cardigan sweater of yours? Now a scarf. That antique vase? Now a jigsaw puzzle. A Bull Terriers coat requires very little to maintain their goofy grin just brush them on occasion to clear out the dead hairs, and they are good to go. They do have some hereditary health concerns, such as the Dalmatian deafness gene. Always do your best to understand a dogs history before you bring them into your home, whether they are from a shelter or a breeder. Back in 1835, breeders combined a Bulldog and an Old English Terrier, resulting in the Bull and Terrier. Later on, the Spanish Pointer was added into the mix to make the Bull and Terrier even bigger. Inevitably, their size, strength and terrier tenacity made them incredibly valuable as fighting dogs. Over time, the sport decreased in popularity (thankfully), and breeding started to focus on their rugged good looks. In 1860, the Bull and Terrier was introduced to the White English Terrier and Dalmatian, which resulted in the breed we know and love today: the Bull Terrier. These dogs, with their all-white coat, incredible physique, and dashingly handsome appearance, paired off effortlessly with the young gentlemen of the time. The Bull Terrier quickly established a reputation as a refined breed that never picked a fight, but if their loved ones were threatened, was sure as heck going to finish it. In fact, their gentlemanly disposition and sheer determination in the defense of others earned them the esteemed nickname White Cavalier. Now, thats a nickname a mom could be proud of! Accepted by the AKC in 1936, this breed has found their way onto the silver screen more than once because of their handsome features. Spuds MacKenzie, the Budweiser dog, and the Target dog, Bullseye, are both Bull Terriers.